Jeremy Levine. Licensed to About.com. 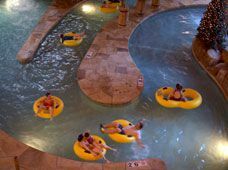 The Great Wolf Lodge offers one of the Dells' largest and best-themed water park resorts. The North Woods atmosphere pervades everything. Some of the guest rooms even include bunk beds built to resemble a wolf's den. The resort takes the art of fun very seriously. The water parks are wonderful. For example, the huge interactive tree house features a 40-foot tall water tower that dumps 1,000 gallons of water on guests every few minutes. And the Howlin Tornado brings funnel ride thrills indoors. But there's more than just water fun at the Great Wolf. Wiley's Woods is an intriguing high-tech, interactive children's role playing adventure. An enormous animated clock tower springs to life several times daily. A 3-D virtual reality theater offers more fun. And each day, families receive a "Lodge Life" itinerary chock full of enticing activities for children. The Great Wolf Lodge offers all-suite hotel rooms with a wide variety of amenities and sizes. On-site dining options include an all-you-can-eat buffet, a sit-down restaurant, a coffee shop, snack bar, and pizzeria. The resort also offers meeting space, a fitness center, and spas--one for adults and one for kids. Wisconsin Dells, Wisconsin. The physical address is 1400 Great Wolf Drive. Water parks for registered hotel guests only and not open to the general public. Wiley's Woods, an interactive children's attraction, is open to the public during non-peak times. Includes funnel ride, wave pool, mat-racing slides, tube slides, body slides, lazy river, hot tub, massive play and spray "tree house," bumper boats, water basketball, and play area for small children. 60,000 square feet of activities including two intertwining innertube slides, large activity pool, lazy river, water basketball, and a children's play area. From Milwaukee and Chicago areas: I-90 West towards Madison to Exit 92 (Hwy 12) to Gasser Road. Left on Gasser and then a left on Great Wolf Drive to resort. Great Wolf Lodge Resort Guide.